Sometimes simple is best. No need to stuff every fruit into your sangria, in fact, why not skip the fruit and get cool as a cucumber? Best of all?! 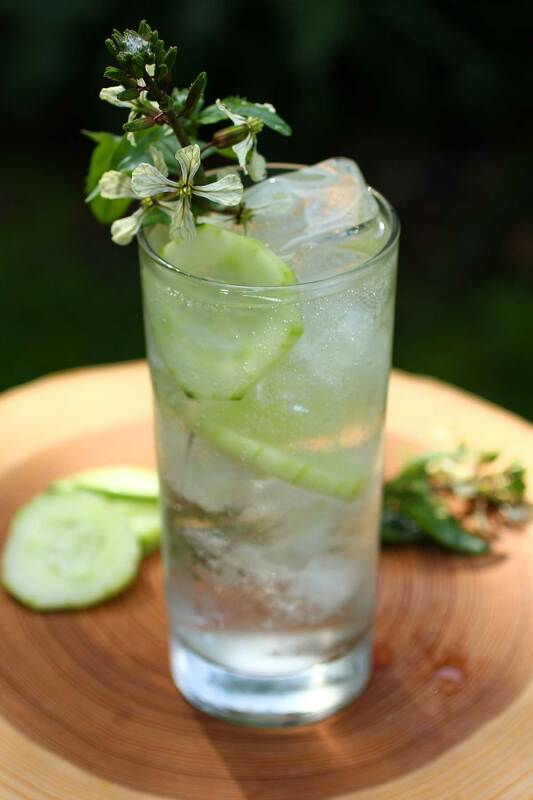 this cucumber white wine spritzer is a batch recipe- so whether you sip it while doing chores or serve it to friends when all the work is done, it is ready to pour and get on with the important things. With the temperature just climbing above seventy yesterday I might be jumping the summertime drink gun a bit but yard work beckons and there is a truth I hold to be self evident when it comes to yard work: it isn’t work if you have a drink while you’re doing it. But, and this is a big but, said drink should be refreshing but not too alcoholic, no IPAs or Margaritas, not if you want to continue doing yard work. You want the alcohol to shake your hand not go in for a long hug. Weed a little, have a sip. Mow until the sweat just begins to form on your brow then step into the shade with drink in hand and ponder the smells of fresh cut grass and flowers. Manual labor, philosophy, cocktails. All things in moderation. Moderation not your thing? Just up the sangria ratio. Moderation really not your thing? Up the orange liqueur in the sangria. Speaking of the orange liqueur use your favorite. The idea is to add sweetness and citrus. I like a sauvignon blanc here but any light summer sipper sort of white wine, like pinot grigio or vino verde, would work. Not sure? take a sip of wine, sample a slice of cucumber. Curious about the origins of sangria? check out this vinepair article Spoiler alert- sangria means blood in spanish so white wine sangria is sort of like a chicken fajita. Yes, if you dilly dally, the ice will begin to melt but that’s okay because really you’re only watering down water. But if you don’t want to water down your water then use frozen green grapes instead of ice. Speaking of dilly dalling- you can make this more than eight hours ahead but the cucumber will lose its crisp. If you want to hold the mixture for longer I suggest removing the cucumber slices- the flavor will still be there but the risk of an embarrassingly soft cucumber will be gone. I used a regular cucumber but an English cucumber might hold up a little better. Peeling optional if using an English cucumber. A note about the garnish. That’s an arugula blossom. If you have some volunteer arugula that’s gone to flower like I do this is an awesome use for it, but even if you don’t you might consider a leaf or two of arugula in here. 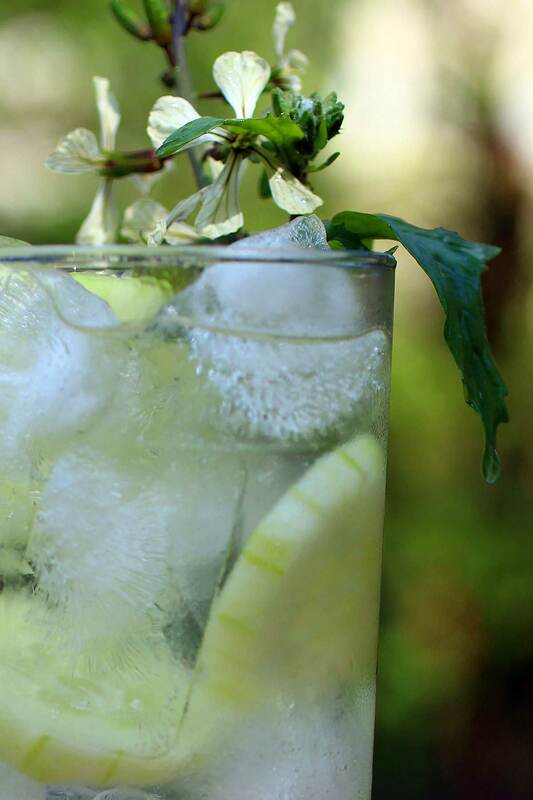 I took a bite of my garnish and the peppery herb was a pleasant counterpoint to the slightly sweet and subtle spritzer. Arugula not your thing? A wedge of lemon or orange is another functional garnish option. 2 cups dry white wine- I prefer a sauvignon Blanc from California or France something that already has hints of green apple and citrus. Combine white wine, cucumber, and orange liqueur. Let sit at least an hour and up to eight. Add two to four ounces of sangria (not including the sliced cucumbers) to a 16 ounce (12 ounce if using green grapes instead of ice) glass. Fill with large ice cubes, or alternately add 10-15 frozen grapes, add some of the cucumber from the sangria base, and top with the fizzy water of your choice. 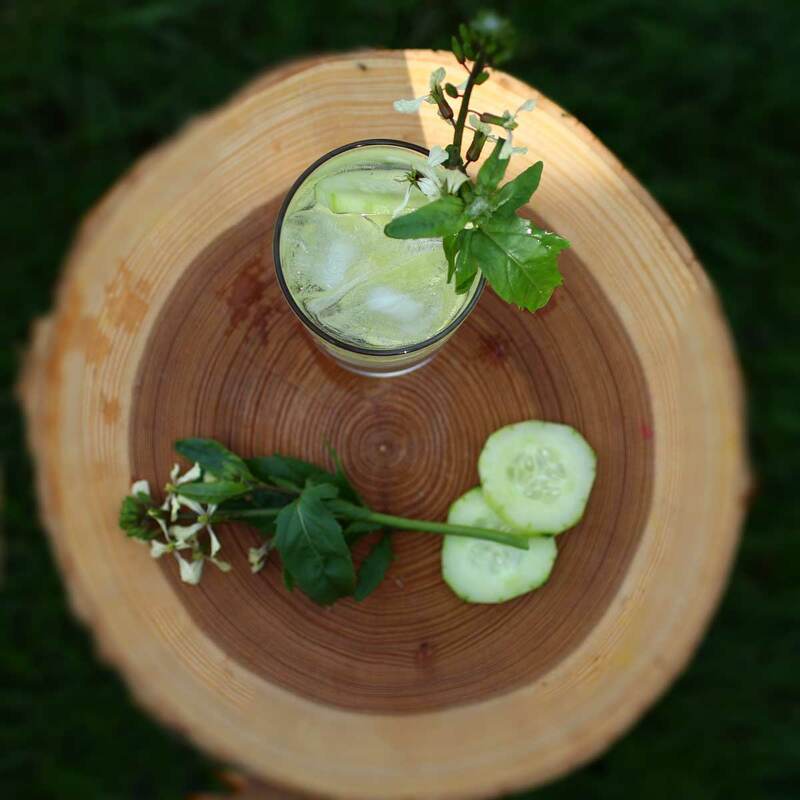 Garnish with a fresh cucumber slice and get out there and mow.